While the candidates’ level of posting was about the same, public response was far from equal.6 In every measurable category of user attention – Facebook shares, comments, and reactions, as well as Twitter retweets – the public responded to Donald Trump’s social media updates more frequently on average than to either of the other candidates’ posts. 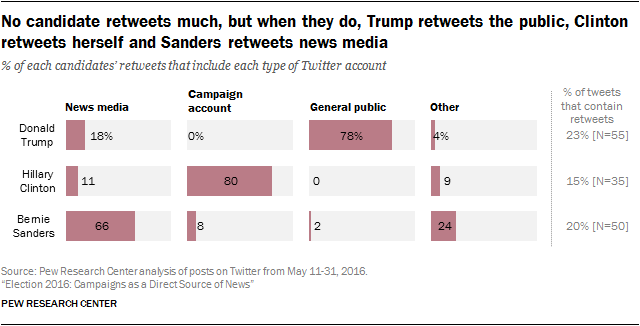 Trump’s posts on Twitter, for example, were retweeted almost 6,000 times on average compared with just over 1,500 for Clinton and almost 2,500 for Sanders.7 This may be due in part to Trump’s higher number of followers. Near the time of publication, he had almost 10 million followers on Twitter compared with Clinton’s 7 million and Sanders’ 3 million, while on Facebook, 9 million followed Trump’s official page, about double the number who followed either Clinton’s or Sanders’ pages. The public response in 2016 is a little harder to compare due to the substantial differences by candidate as well as a slight change in the study’s methodology across time.8 However, it is worth noting the overall numbers as a general reference point. In 2012, Obama’s Facebook posts received over 40,000 likes on average, while Romney’s received about 19,000; on Twitter, both received fewer than 600 retweets per post. 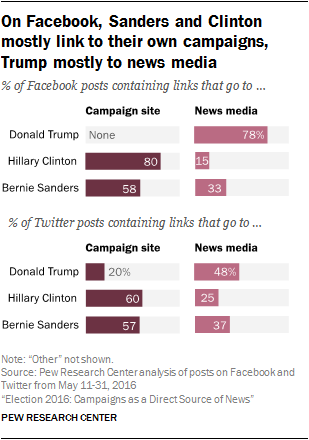 Within their Facebook posts, the candidates included external links at similar rates: 30% of Clinton’s posts on Facebook included links, as did 32% of Sanders’ posts and 30% of Trump’s posts.9 What they linked to, however, varied a great deal. 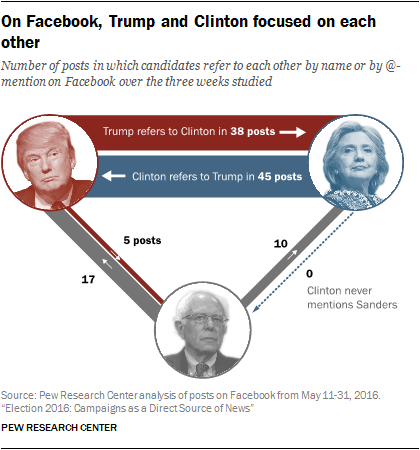 Like Obama and Romney in 2012, Clinton’s and Sanders’ Facebook feeds most often linked to their own official campaign websites or social media accounts. 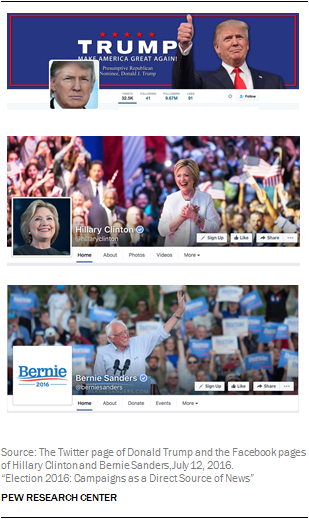 Fully 80% of Clinton’s Facebook posts with links went to campaign pages, as did 58% of Sanders’ Facebook posts. These include links to campaign events, videos (both recorded and streaming) and donation pages. About a quarter (23%) of Trump’s tweets were retweets, as were one-in-five of Sanders’ and 15% of Clinton’s. 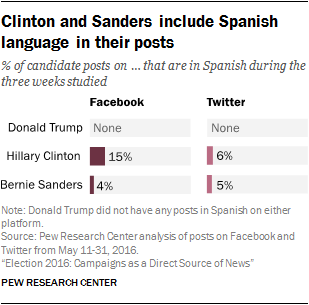 The candidates’ retweets, however, reflected different strategies. Trump was most likely to retweet the public, Clinton her own campaign accounts and Sanders the news media. Of Trump’s 55 retweets, about eight-in-ten (78%) were of people who were not famous and had no discernable ties to news media, government or other organizations – in other words, the general public. Most were of supporters offering congratulations or compliments to Trump, to which he often responded at the end of the post (see example).10 Some, though, were posts that made critical statements about others; Trump has taken some criticism for these types of retweets. In a May debate, for example, Fox News host Megyn Kelly questioned Trump about his retweets of derogatory statements about Kelly made by private citizens. “@markgruber1960: @megynkelly@realDonaldTrump That’s why he is so successful. He is driven to succeed” True! On Twitter, the pattern was largely the same, though neither celebrities nor family members were present in the same numbers. Trump @-mentioned other users 112 times. In these mentions, he focused largely on the news media, naming media outlets or journalists in about three-quarters (72%) of his @-mentions.12 Most informed followers of a TV news appearance, highlighted news stories about himself or his issues, or attacked particular outlets. The New York Times was the most frequent target of the latter type of mention, especially in the wake of an investigation it published into Trump’s relationship with women.